We spend a lot of time outdoors during the summer months, and one of our favorite things to do is to dine outside. Dinner is usually out on the deck, but on the weekends we like to bring along a picnic lunch if we are out on a hike, a bike ride, or just strolling around the park. When it comes to summer eats, I try to keep it simple, maybe packing sandwiches or salads. Since we are just entering peak grilling season (hurray for not having to turn the stove on during the day!) I love that I can toss most of our food on the grill for a no muss, no fuss kind of meal. 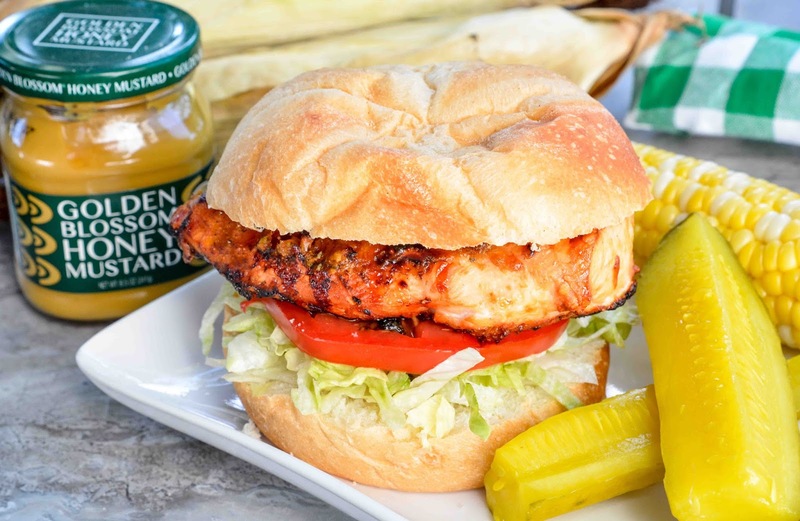 Jason and the girls are all about grilled veggies and grilled chicken during the summer, so I thought it would be nice to try out this Grilled Chicken Sandwich made with Golden Blossom Honey Mustard for lunch the other day. Many times when we get to a picnic area, the public grills have already been claimed. 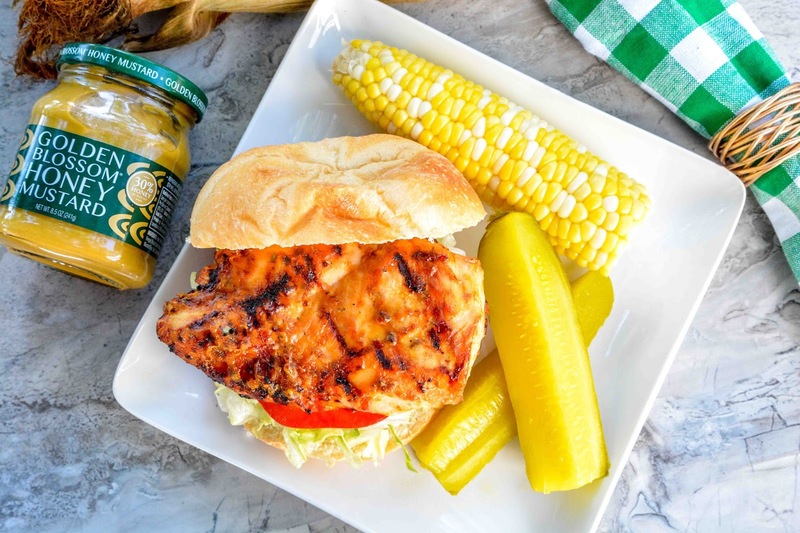 So, what I think is nice about this recipe is you can grill it up early in the day, then pack it in your picnic basket to enjoy later. Not only will you not be competing for a grill, you don't have to lug all of your grilling tools to the park. Winner! What items do you like to pack in your picnic basket? I like chicken sandwiches just as much, if not more than hamburgers. This looks good! My boys always want a pickle on their plate with sandwiches, or burgers. It's not as heavy in the tummy as a burger either. Of course, picnics must include pickles! Mica wants to make a hamburger business. It make me think about this post. Maybe he'll add chicken sandwiches too. I love his entrepreneurial spirit! I'd say I like his idea much better than a boring lemonade stand. Who wants lemonade when you can have burgers delivered right to your door!? I hope his business is successful this summer! Never been on a picnic in my sad life, but I do love me pickles! We bring a roll of heavy duty aluminum foil to stick over the grates so the food never touches the actual grill. I think that's what most sensible people do in public picnic areas. Most food can be grilled in foil packets too, so it's easy to just wrap up the meat or veggies in foil before leaving to toss on the grill. Why don't you pack yourself a picnic and head to to park? You have such a pretty city, I am sure you have nice parks too? You could eat your lunch under a shade tree and read a book or people watch. Packed and ready to go, sure beats public grills. Public anything sure can be nasty as can be. Bring my own chicken with thee. A time and health saver having it ready to go before arriving at the park! Hahahaha! Maybe invite him to lunch next time so he doesn't need to steal it. Grilled chicken sandwiches are my fave! I always make sure my husband grills me up a nice chicken breast when he cooks out. I love the honey mustard addition! Grilled chicken sandwiches are so good! 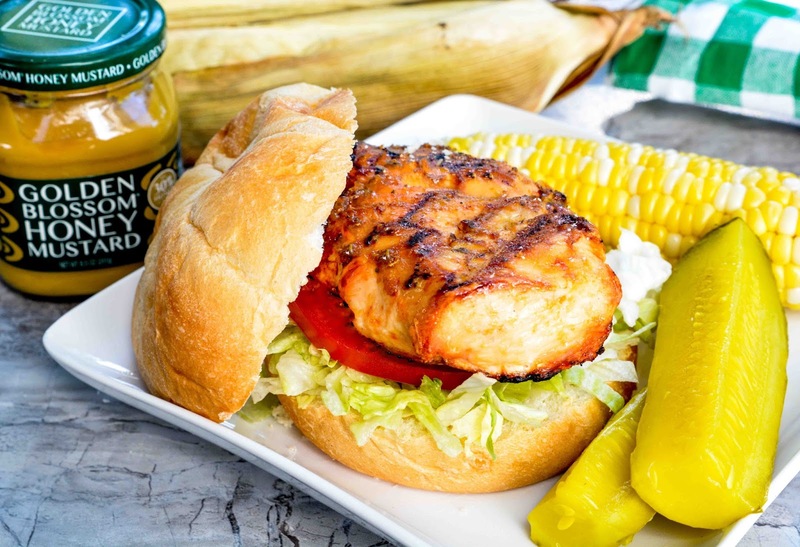 I love that smoky flavor that they get on the grill, and they're so good on a fresh bun! I don't eat a lot of red meat, so chicken is my jam. I could eat a grilled chicken sandwich all.day.long! Delicious! And we love honey mustard, this looks amazing! I had no idea Golden Blossom made this one! Delicious and perfect for a picnic indeed. I'm sure the spicy heat with the kick of sweet is insanely good. Oh yum this sounds absolutely delicious, there is something about grilled chicken that tastes delicious. Wow! This looks so delicious! What a perfect recipe for summer time. We are always grilling and having picnics, and this would be a great idea to make. That's smart to cook your food in advance so you're not fighting over a grill! I love fruit in picnic baskets! Great recipe. Makes me want to get out there and BBQ right now! That is pretty close to my own recipe. It looks amazing and I will have to try it! I cannot deny that I love a good chicken sandwich. This one looks perfect. It's the perfect combination of spicy and tangy. picnic time! I have been preparing a lot of sandwiches for Ifthar or breaking the fas as well, Theresa...it's nice, simple, and yummy! WE just grilled out. I like chicken sandwiches for grilling for sure. Totally love the idea of this one! I think it's better to just grill it during the morning and just bring it with you on your picnic. The recipe sounds amazing and it's a sandwich that my two boys will eat right up. My husband and I have been enjoying the grill ever since summer started! It's a nice way to make dishes that we enjoy without heating up the kitchen. This sandwich is a must try! This sandwich looks so amazing. I could definitely make these to go on our next outing. Those chicken burgers look so good! My eldest son prefers chicken burgers over regular beef patty burgers. I am sure he will have a happy tummy when we make this on the weekend. This looks and sounds like a yummy recipe! I bet our kids would love this too! Now that there looks like a lunch. Is it weird I'd never thought of meal prepping chicken to make sandwiches? That is smart to prepare it ahead of time. Grilled chicken sammies like this one would make my whole family happy. And hurrah for good weather!